Few expect that Burma's elections on 7 November - the country's first in 20 years - will do much more than than secure the military's grip on power. But there is growing concern that the junta will use the polls to strengthen control over the country's ethnic minorities. The groups make up 40% of Burma's population. They have been demanding - without success - greater regional autonomy from the majority Burman-led central government since independence from Britain in 1948. Many have suffered persecution at the hands of the government, with widespread reports of forced labour, torture, village destruction and executions. Some have reached ceasefire agreements with the authorities, but others are engaged in conflict with Burmese troops. Tomas Ojea Quintana, the UN's Special Rapporteur for Burma, says the government should be investigated for possible crimes against humanity over its treatment of ethnic minorities. He also says it must engage in "meaningful dialogue" with them if the elections are to be credible. Failure to do so, others warn, could lead to an escalation of conflict. But the generals in Nay Pyi Taw do not appear to be listening. The Karenni are a branch of the Karen ethnic group - their name means the Red Karens. They live in Kayin (Karenni) state, one of the least developed areas of the country. Like many groups the Karenni have suffered attacks and have been forcibly removed from their land. Rights groups say this is an attempt by the army to seize their region's natural resources. The Kachin, originally thought to have come from Tibet, encompass several smaller ethnic sub-groups. They are primarily Christian, having been converted by American Baptist missionaries in the 19th Century, and have a strong clan-based social system. The Kachin Independence Organisation (KIO) has a ceasefire agreement with the government and has administrative control over the region. It is enormously popular within the state, running schools and hospitals. But it maintains an armed wing which it says has more than 10,000 troops and is ready to fight. The Chin were originally animist but mostly converted to Christianity in the 19th Century. Numbering about 1.5 million, they live mostly in the remote Chin state, close to the border with India. Human rights groups have warned they are one of the most oppressed ethnic groups in Burma, facing religious persecution and violence at the hands of both the national and the Chin ethnic armies. They also face acute food shortages and those who escape to India are often repatriated. The Wa live primarily in the self-administrative division of Shan state. They have close ties with China and many use Mandarin as a second language. The Wa follow traditional animist religions although some have converted to Christianity. The Wa area is largely controlled by the United Wa State Army (UWSA), one of the most powerful of the ethnic armies, with some 30,000 in its militia. A ceasefire agreement with the junta has enabled it to gain control over a large area. It makes huge profits from drug and weapons production and smuggling. The mostly Muslim Rohingya are considered one of the world's most persecuted minority groups. Burma denies them citizenship and they cannot own land, vote, travel or marry. They have suffered well-documented abuse and forced labour at the hands of the military. Hundreds of thousands have fled to Thailand or Bangladesh, where they have ethnic ties, but have often been forced back over the border. Some have been forcibly been sent out to sea. The Shan are the largest of Burma's ethnic minorities, numbering an estimated 6 million. They are spread across the large Shan state and into Kayah (Karen) and Kachin states and the central Mandalay division. The Shan are mostly Buddhists, have their own language and script and have close links to the Tai ethnic groups in south-western China. At one point, Shan state was producing about half the world's opium, controlled by the Shan warlord, Khun Sa. The Shan are represented in the election by the largest of the ethnic parties, the Shan Nationalities Democratic Party. The Mon are thought to be one of Burma's oldest ethnic groups and to have brought Buddhism to the country. Most Mon still follow the religion. 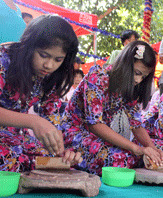 They live mostly in the south of the country but have close links with Thailand and the Khmer in Cambodia. The New Mon State Party (NMSP) has a ceasefire with the junta giving it some control over the state, but analysts say the movement has been weakened by internal divisions. Ethnic Mon are reported to suffer regular attacks by junta troops. The Karen, Burma's second largest ethnic minority, fought alongside the British against Japan in WWII. They were promised an independent state in return but this never happened and they have since been viewed as collaborators by the majority Burman government and have faced brutal repression. As a result, tens of thousands of Karen, many of whom are Christian, have fled their homes and live abroad or in hiding. While many Karen still live in Kayah (Karen) state, they are widely dispersed, making political representation more difficult. 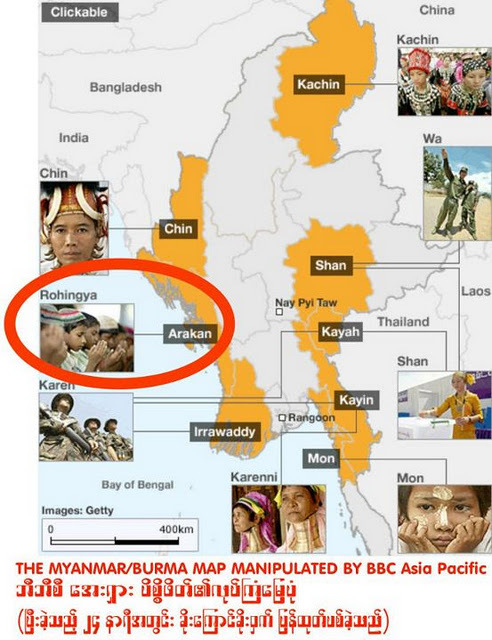 Rakhine people make up the majority in Arakan state and are thought to constitute about 5% of Burma's population. Rakhine people also live in southern parts of Bangladesh and are mainly Theravada Buddhists. 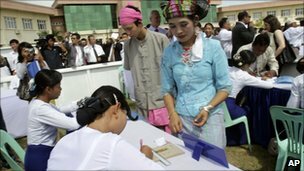 Several ethnic Rakhine parties are contesting the elections, the largest of which is the Rakhine Nationalities Development Party. Hundreds of thousands of ethnic voters will be unable to take part in the polls, either because they have been displaced or because in areas deemed too volatile, polling will not take place at all. Some of the groups are boycotting the polls, echoing the stance of the now-defunct main opposition group, the National League for Democracy (NLD). The Arakan Rohingya National Organisation (Arno), representing one of Burma's most persecuted minorities, said no credible election could be held under the "strange and undemocratic constitution". But some 35 ethnic minority parties have nonetheless been approved to run. Critics say many are little more than proxy parties for the military - the only party representing the Kachin minority in Kachin state, for example, is the Unity and Democracy Party of Kachin State (UDPKS), formed by members of the mass junta-support organisation, the Union Solidarity and Development Association (USDA). Those genuine ethnic parties that are running say they are doing so with little optimism but in the hope that participation will, in the long run, bring benefits. "The government has announced that it will hold free and fair elections and we believe and expect this," Sai Ai Pao, leader of the Shan Nationalities Democratic Party (SNDP) told AFP news agency. "I cannot guarantee it will completely happen. We just hope, that's why we are planning to participate," he said. Other parties say they have no choice but to stand up and attempt to be counted. "We, ethnic Chin groups that are very poor, must not waste this advantage," Pu No Than Kap, a member of Chin Progressive Party (CPP), told Mizzima news agency. "It is also certain that the advantage will not be fully granted and the polls will not be free and fair at all. But we should not fail to seize this advantage." The government has, however, cancelled elections entirely in five key ethnic areas. The security situation in Kachin, Kayah, Kayin, Mon and Shan states was such that the elections could not be "free and fair", it said in September. In Shan state, some 17,000 villages will not hold polls, nearly 3,000 villages in Kachin state are affected and nearly 50% of Karen state will have no elections, the Alternative Asean Network (Altasean) reports, disenfranchising an estimated 1.5 million voters in ethnic areas. Who votes and who does not may in the end have little relevance. Even if representatives of ethnic groups do secure seats in parliament, they would be far short of the numbers needed to effect legislative or constitutional change. Moreover, the national government can overrule state-level decisions and the president retains the power to appoint the most senior posts in each state. It can also declare a state of emergency in any areas where "national solidarity" is deemed to be at risk. This, say critics, will be used as an excuse to crush ethnic groups whose fighters have not put down their arms. These armies, many of which have been fighting the government on and off for 60 years, are coming under intense - sometimes brutal - pressure from the government to transform themselves into a single Border Guards Force, under central control. But the armies say they play a vital role in protecting civilians. They anticipate a major military crackdown after the election. One member of the Mon National Democratic Front (MNDF) told the BBC earlier this year: "Not only will the election not help in solving all the problems but also it will be the start of more problems. "This election can be the beginning of the greater revolution I'm afraid. I don't want more violence in Myanmar (Burma)." Even before the polls took place, there were reports of a major armed stand-off between Burmese troops and the popular Kachin Independence Organisation (KIO). In preparation for conflict, several armies are forming alliances - promising their support if one is attacked. There are suggestions that such a united front could ultimately strengthen the ethnic cause. "We now have no real option but to unite, politically and militarily," AFP quoted Kachin spokesman Lahpai Nawdin as saying. Whether or not violence breaks out, many believe Burma's ethnic groups will suffer further post-election. Zipporah Sein, general secretary of the Karen National Union (KNU) said the constitution that paved the way for the polls set in place "a death sentence for ethnic diversity in Burma". "We will be given no right to practice our custom, to speak and teach our languages," Ms Sein told the Irrawaddy newspaper. "The process of Burmanisation that has already been going on for decades will be accelerated." Aid agencies and opposition groups agree that unless the needs of Burma's ethnic minorities are addressed and they are fairly represented, there can be no progress in the country. Mark Farmaner of UK-based charity Burma Campaign, describes failure to grant ethnic groups greater autonomy as "the root cause of the instability in Burma". "These elections don't come close to addressing that," he said. "In fact, they are a step in the opposition direction." UPDATE 28 October 2011: The map in this article was temporarily removed on 27 October 2011 to make some changes. It has now been replaced with an updated version which includes a section on the Rakhine people.